Eggs are convenient, quick and cheap source of protein, we must take advantage of this. I do always. It helps that we can pack in loads of vegetables along with our eggs even for the breakfast. I know many people who balk at the thought of having vegetables along with breakfast and even if they try they get bored with the vegetables. No one ever gets bored with the breads and the fruit preserves and the nut butters or bacon, vegetables feel too boring to be had everyday. I love my vegetables and can have them any time of the day but even I get bored with the same ways to cook them. Variation is the key when you resolve to eat more vegetables or anything that is good for you every single day. 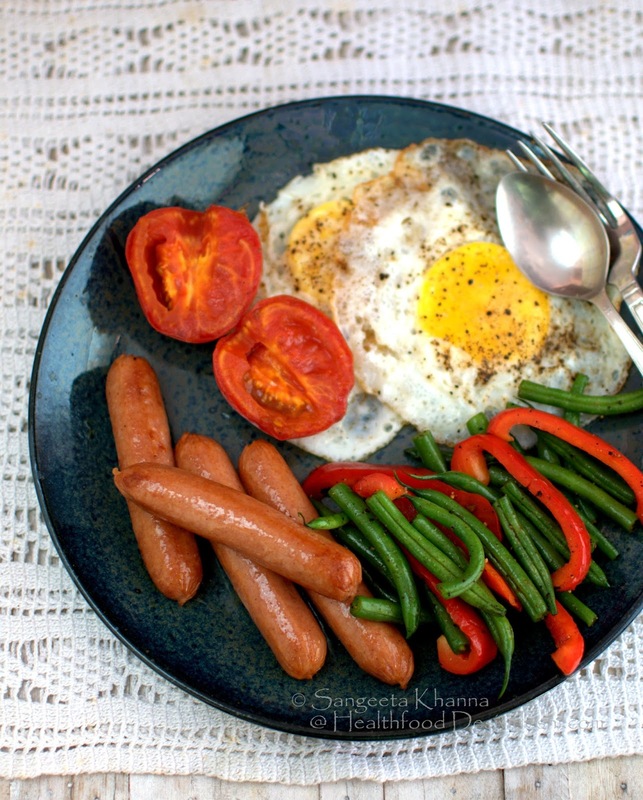 Eggs and vegetables to be combined for breakfast is the easiest way to ensure one gets the advantage of starting healthy early in the day, this kind of breakfast prevents from any binge eating before lunch time or even after that. Trust me. The key is to shop for vegetables mindfully, get them cleaned and chopped in advance and be ready for a quick filling breakfast in the morning. Here is the recipe of the day. Spinach spring onion and feta cheese frittata. Whisk the eggs with the minced garlic if using and salt and pepper. Keep aside. Grease the deep dish, spread the spinach first, press down and then spread the spring onions and the chopped sun dried tomatoes. Pour the whisked eggs over it and then top it with crumbled feta cheese. You can use any other cheese you like. Toss in some bits of bacon or ham or even boiled and shredded chicken if you like. At this time you would notice the eggs are not visible in the dish. Bake at 180C in preheated oven, covered with aluminium foil to prevent burning the surface. 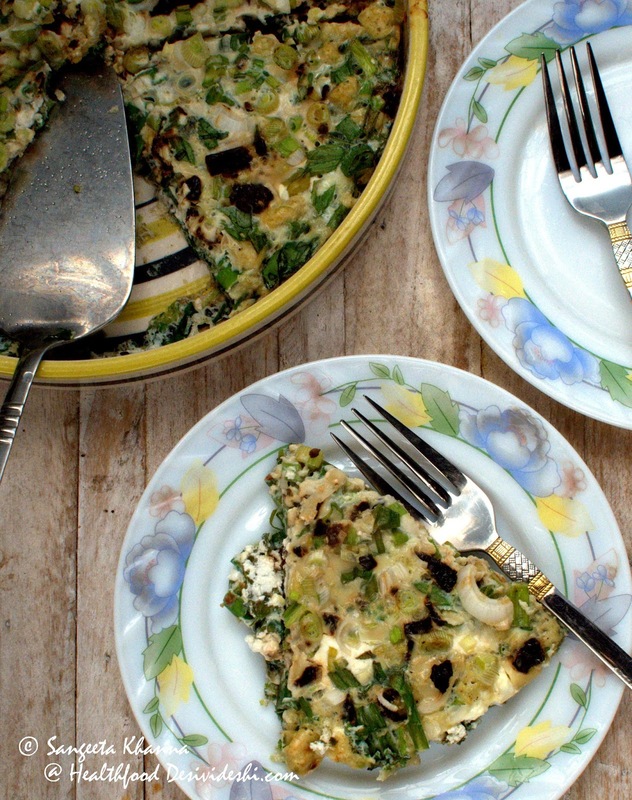 The frittata should be done in about 20 minutes, check by poking a fork if the eggs are set. You can grate some cheese over it and broil again till it melts. 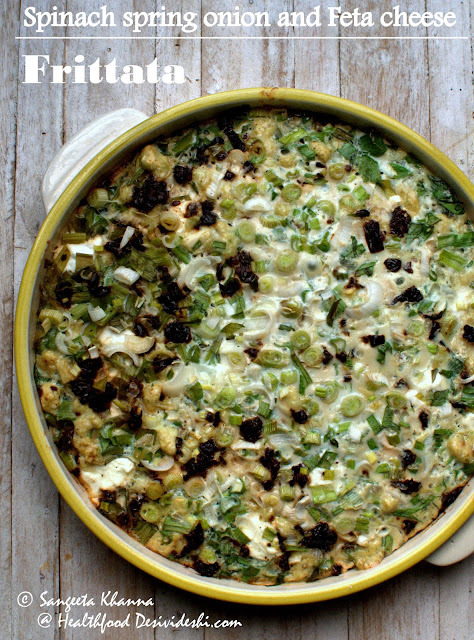 The eggs will cook and fluff up, you will be able to see the cooked eggs with a rich green mosaic of the vegetables. And feta cheese makes plain boiled eggs quite interesting too. I use feta over some grilled eggplant sliced to make sandwich and supplement the breakfast with boiled eggs. 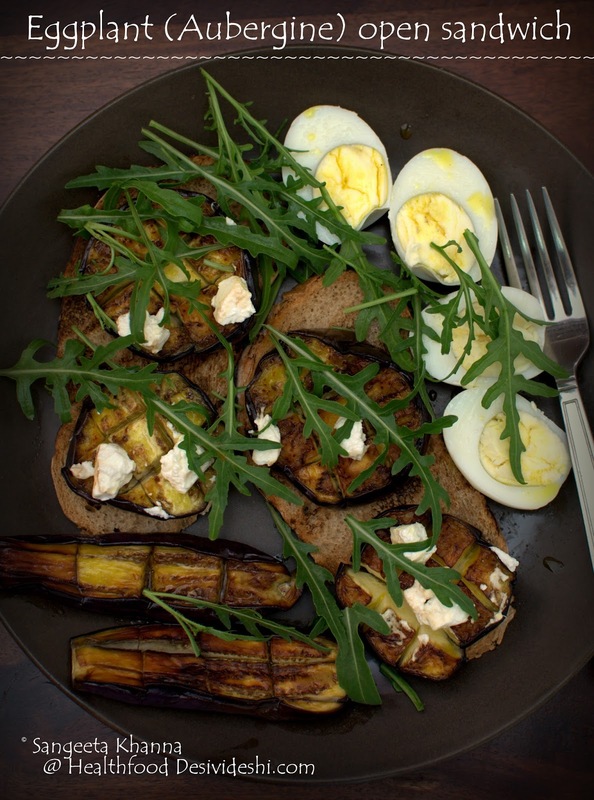 Very this sliced of bread, fat slices of eggplants, loads of greens, some feta and boiled eggs. Not much cooking involved to make a filling delicious breakfast. And then we have boiled eggs topped with loads of this Indian style coleslaw or kachumber. Plain boiled eggs are halved and then topped with some grated carrot, chopped coriander greens, chopped green chillies or capsicum and some chopped onions. This is drizzled with some extra virgin olive oil and salt and pepper to taste. A simpler version of this Indian style egg salad is a common street food during north Indian winters, especially in the mountains. Another egg salad is the one that I make when we have some lettuce growing int he garden. Some torn lettuce of choice, some thinly sliced onions, and some chopped boiled eggs. 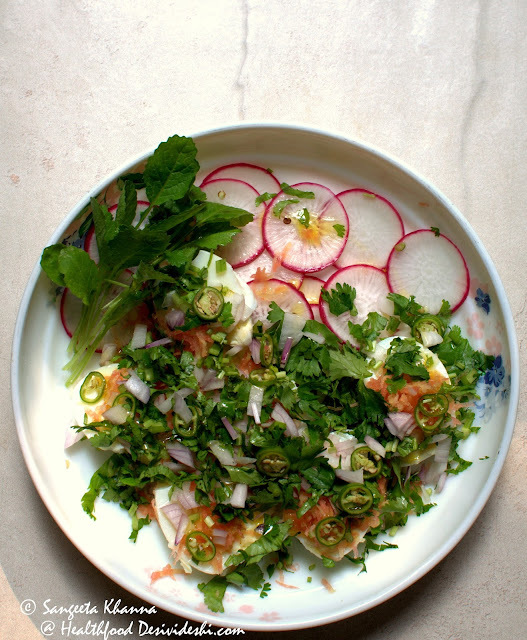 Everything is tossed with a light cream based dressing. Mix minced garlic, salt and pepper along with some mustard and whisk, add to the salad and mix lightly. Serve immediately. 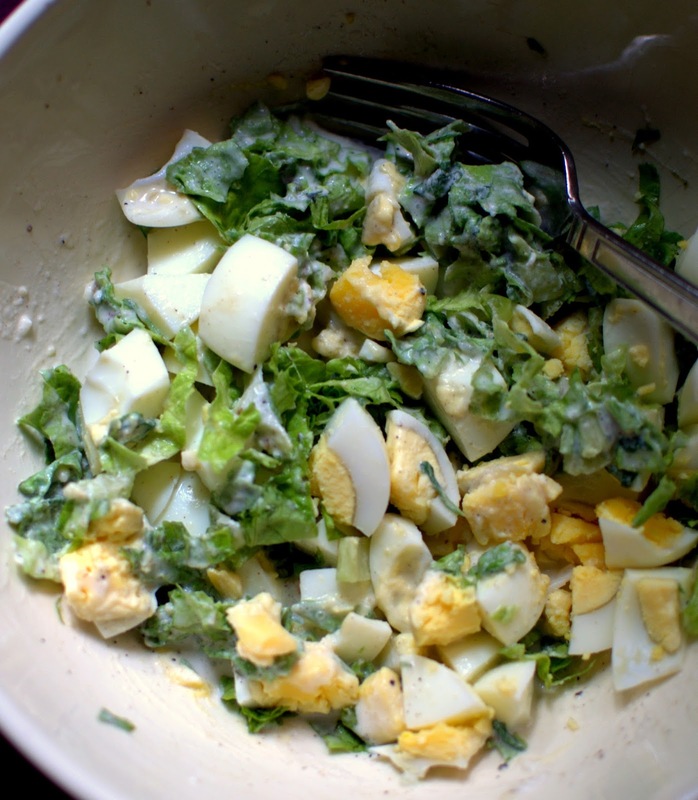 This is one versatile egg salad and we keep changing the greens as per season. Some tomatoes and baby spinach also make this salad very nice. And who doesn't like a nicely scrambled eggs? This version is a bacon, chives and Parmesan scrambled eggs and is loaded with chopped onions and fat green chillies (mild hot). 1/2 cup minced onions sauteed with butter till brownish, some sliced fat green chillies of cubed capsicum thrown in along with chopped bacon and then some parsley and whisked eggs. 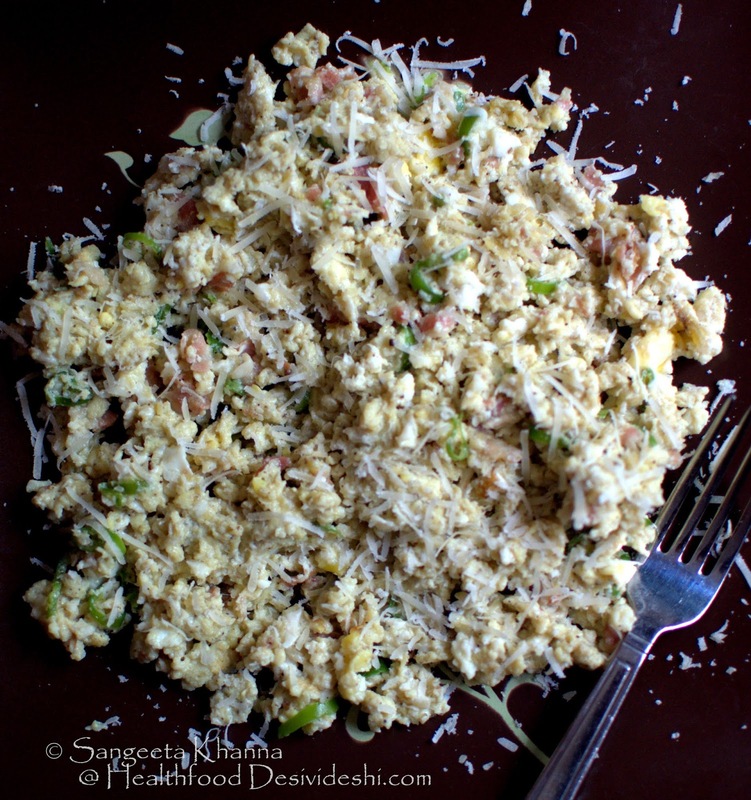 Scramble, season and then grate some Parmesan over it and enjoy as it is. 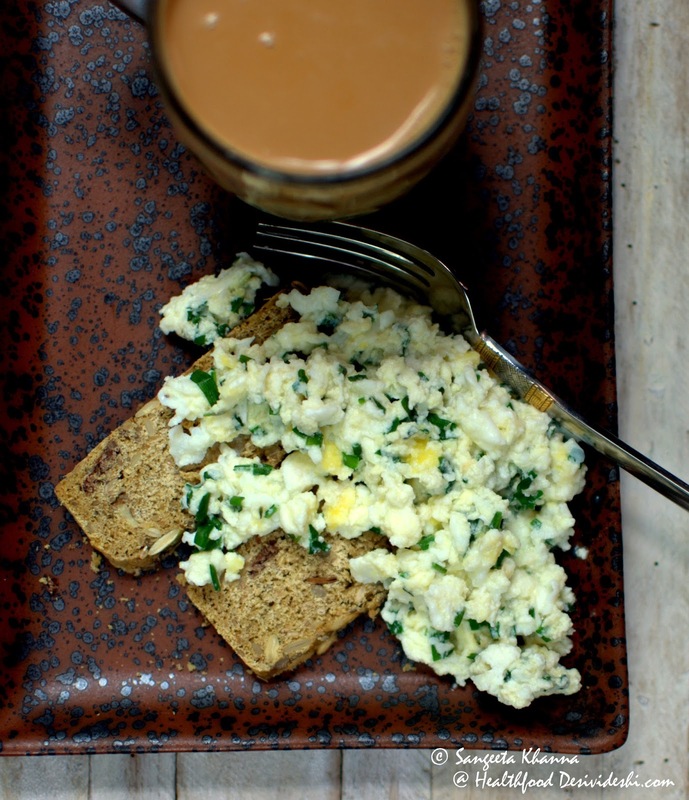 The all season favourite is the chives scrambled egg. Half a cup of chopped chives for 2-3 eggs and salt and pepper to season. I cook this scramble mostly with a tbsp of light cream or even some milk and not butter. It turns out great every time. With a multi grain bread and ginger chai this makes a happy breakfast for us. And talking about the egg scrambles, one of the most popular in my home is the drumstick leaves egg scramble. 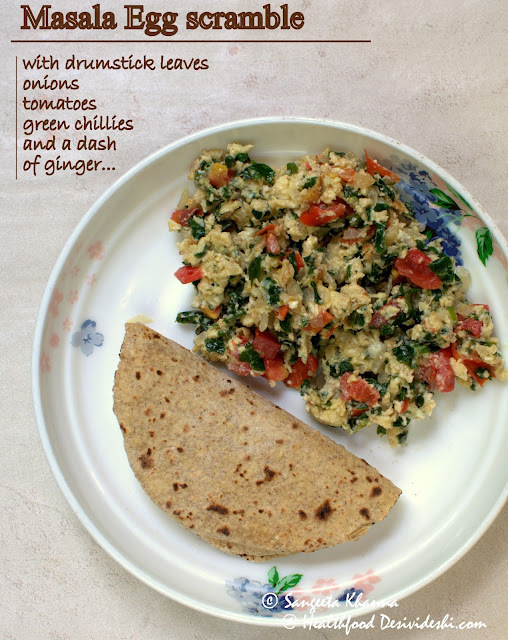 We normally make it for a weekend brunch and have it with our multigrain roti. This kind of a brunch takes care of our weekends when we work in the garden or do spring cleaning of the house. And Spanish omelets need not be too neat and nicely layered. My Spanish omelets are mostly a mosaic of colours like this. I saute quartered tomatoes, coloured bell peppers and some chucks of onion with some salt and pepper and then pour whisked eggs. Cover the pan and flip the omelet after a couple of minutes. 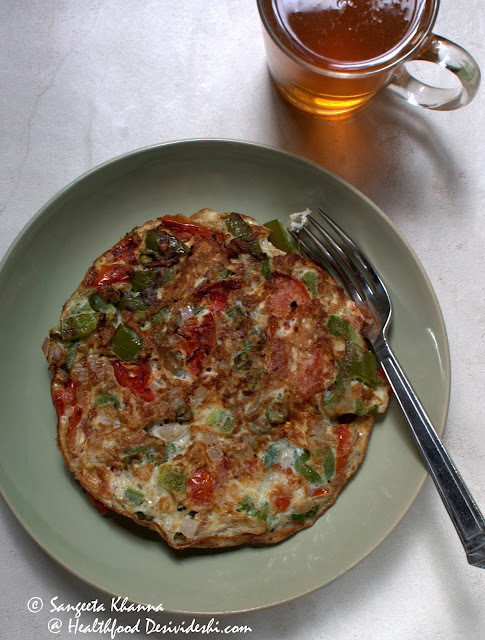 This Spanish omelet is ready in about 3 minutes and serves one. Fried eggs demand some bacon or sausages and of course some grilled vegetables. I grill the sausages and vegetables in a pan first, empty them all on the plate and then break the eggs in the same pan without adding any more butter to cook them. Wait till the yolk gets ready to your choice and flip them on to the plate. Eat/serve immediately. 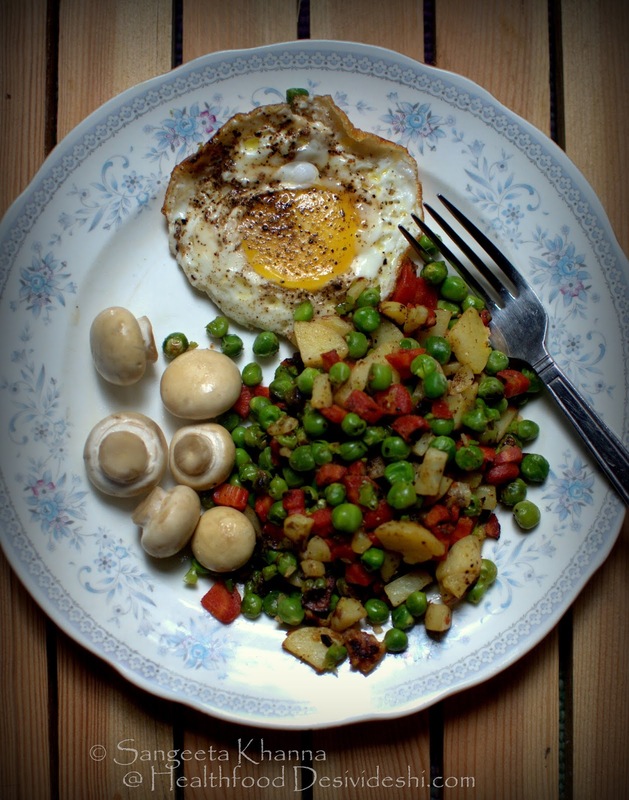 Some mushrooms and a mix of peas, carrots and potatoes is a great change to the eggs and vegetable routine too. This carrot and peas is mostly made pepper hot, the way I like it. The most common thing I do when I make a masala omelet is to throw somee chopped vegetables in the same pan and cover it for a couple of minutes, no extra fat required for this half done stir fry. My vegetables on the side of an omelet is ready to devour. This way you get some onion, coriander leaves etc in the omelet and some more vegetables on the side. I stir fry some vegetables in a pan and boil the eggs on the other stove, quickly soft boiled eggs with warm stir fry with herbs and pepper is very comforting. 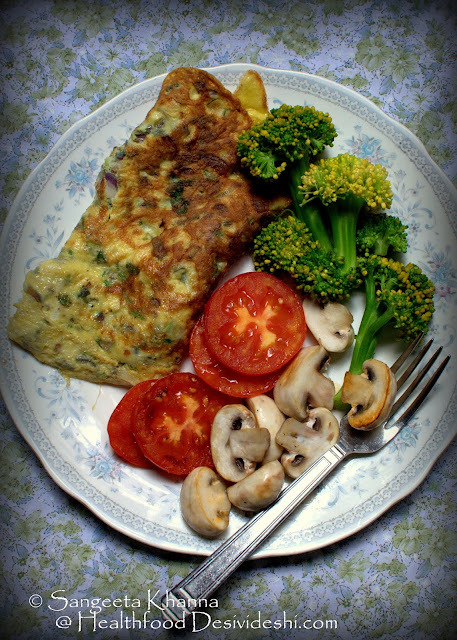 I am sure you got an idea how you can eat eggs regularly along with vegetables of your choice and still make it interesting and delicious every single day. I will keep sharing more ideas because we eat eggs a lot. I keep sharing my meals and breakfasts on my Instagram page too, follow me there if you want more ideas. Mmmm... such variety, color and of course, good nutrition! Yummy breakfast and healthy too ! Hello Sangita such amazing ways to use eggs. I just wanted to ask you since you know Banaras so intimately, if could tell me the best places to buy cotton cloth to make kurtas (which part of Banaras and any particular shops?). I had bought it there when i had visited last time but have forgotten which area it was and have lost touch with that friend. My parents are there now, staying at the Rajghat School study centre, perhaps you have heard of it? My parents will be leaving on this coming Tue so were planning to go tomorrow to the shops. I do hope you don't mind me asking on the comments section of this blog, I could find no way to contact you. 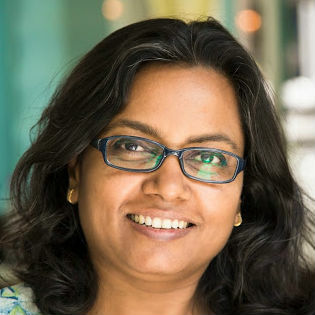 Hi Karuna, Yes I know Rajghat school. It has been really long since I shopped for cotton fabric in Banaras but I remember I used to buy from Khadi gramodyog (Sigra and Lanka stores),a few small shops in Bansphatak area and a shop in Lanka called Raja textile or something. I am sorry I wont be of much help here as I now buy all my cotton fabric from the places I visit and from the Trade fair here in Delhi. No I don't mind such questions on the blog. Thank you so much, will ask parents to check out those shops. This is a killer post, each dish looks so yumm. And Frittata took my heart. Love eggs! Thanks for sharing these amazing breakfast ideas...I'm concerned about loss of nutrition from pre-cut veggies. Can you throw some light on that? If you don't rinse the vegetables after chopping they don't loose much nutrients when stored in refrigerator. Some studies suggest better nutrient conservation in frozen vegetables so I am in favour of making my life simpler by keeping some pre cut vegetables in my fridge. Linnet Pinto I hope this answers your doubts, so many people don't eat vegetables as it is a lot of work while cooking from scratch, making it simpler helps in many ways.